Today was warmer and just one uniform shade of grey. This morning we travelled by car to New Milton where I visited the dry cleaners, the post office, and the bank. I collected cleaning, mailed a parcel and some letters, and paid a bill. All rather mundane really. 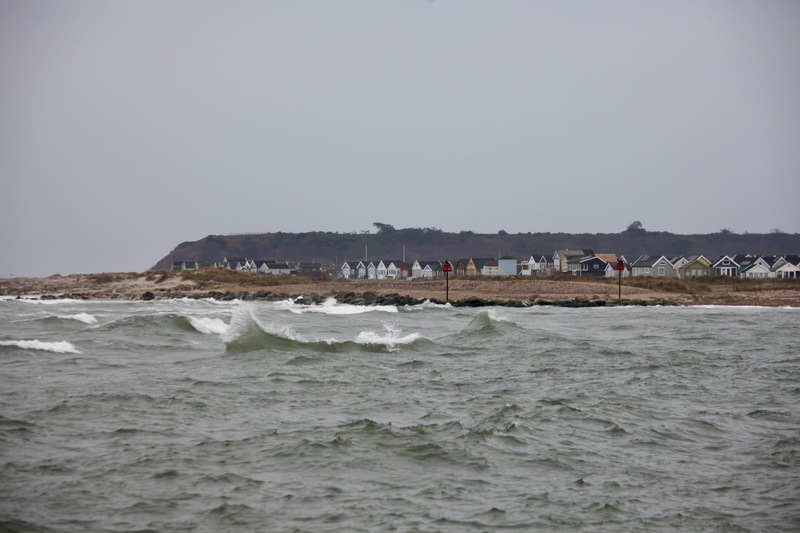 Jackie drove us on to Mudeford Quay where I went for a wander. 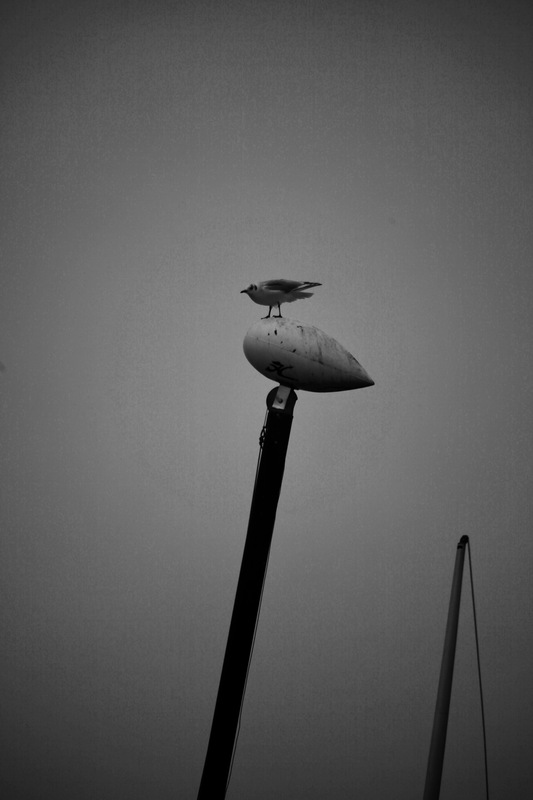 On the sheltered side of the quay, not even the gulls occupied the benches. 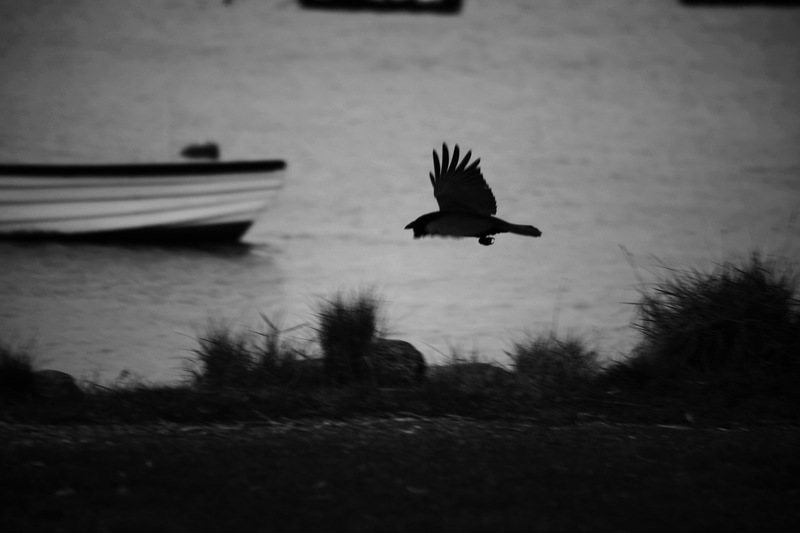 A crow took off on my approach. the solitary audience of the jingle jangling rigging orchestral performance. Most such scavengers harassed those drivers and their passengers taking a break in the car park. I wonder if anyone has any ideas about what the woman on the spit was seeking. Stones? Shells? 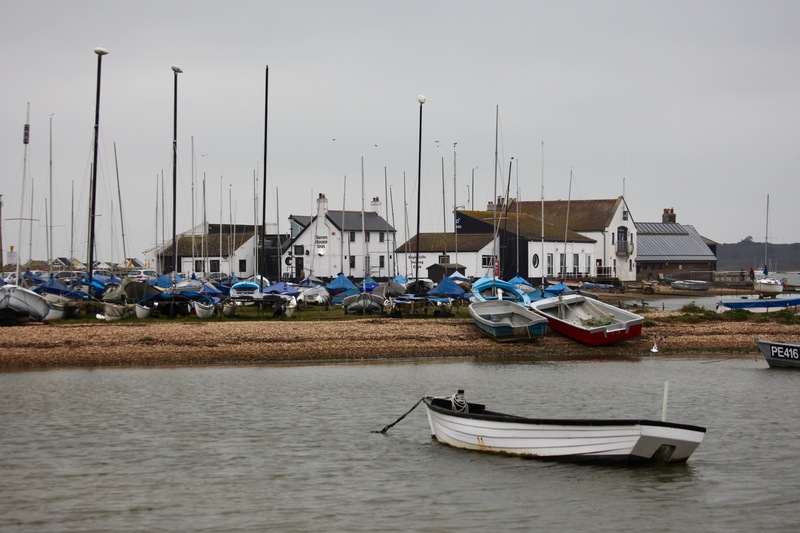 She, of course ventured on the rougher, seaward, side of the harbour, where the waves roared, and no-one emerged from the beach huts. 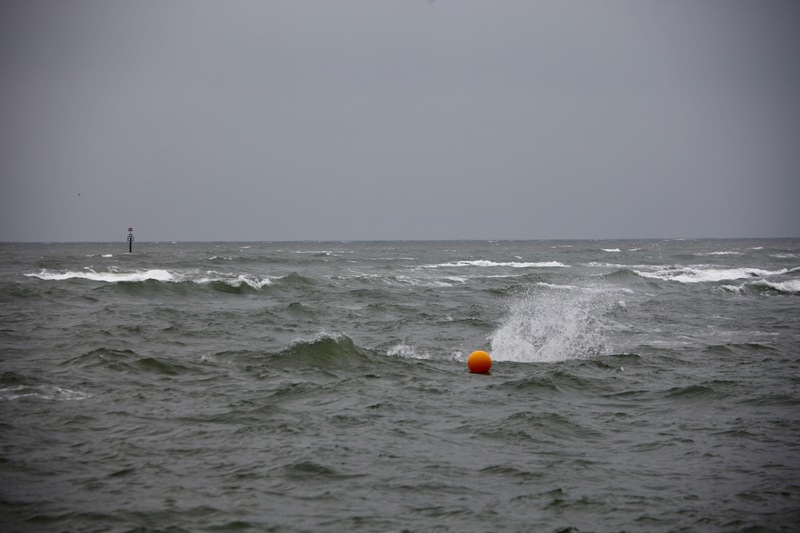 A bright orange buoy bobbed on the surface. This evening we dined on lemon chicken with perfect carrots, cauliflower, greens, and boiled potatoes, followed by profiteroles. I drank Château Plessis grand vin de Bordeaux 2014. CLICK ON IMAGES TO ENLARGE. THOSE IN GROUPS ACCESS GALLERIES THAT MAY BE VIEWED FULL SIZE. 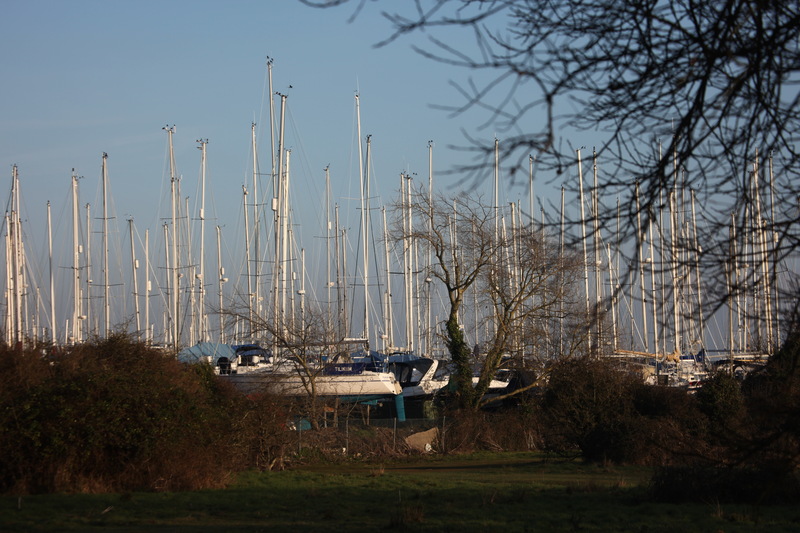 When I walked around the Keyhaven – Lymington Nature Reserve recently I finished up at the boat yard I now know is the Lymington Yacht Haven. Today I chose to begin at the Haven and wander around it. 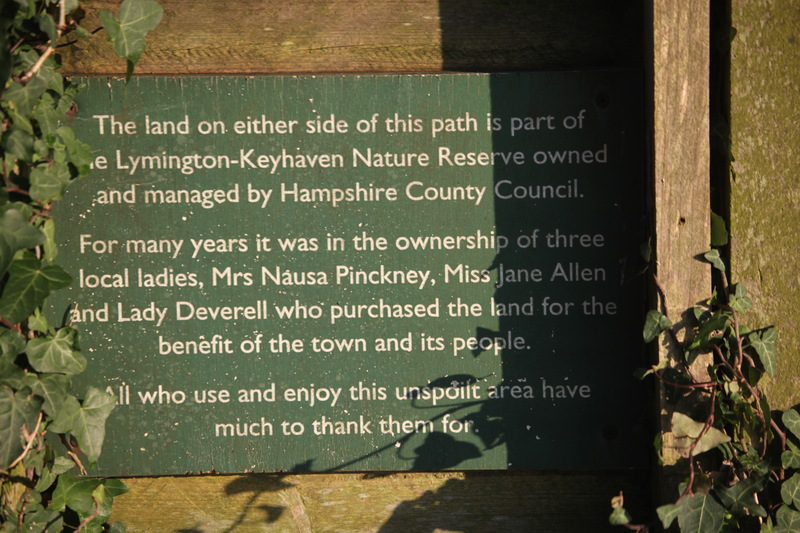 Jackie therefore drove me to Pinckney Path from which I had returned to Normandy Lane. 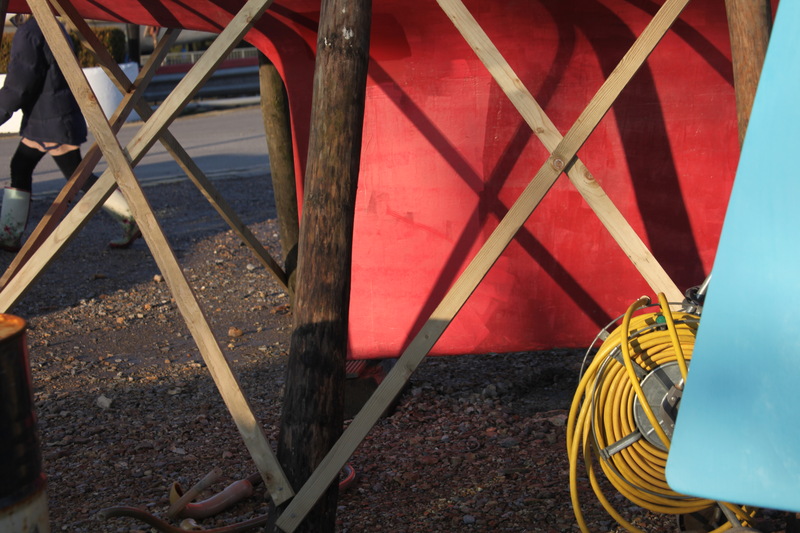 A walker, presumably having emerged from the bird sanctuary, passed me as I stooped to photograph supports of a boat. 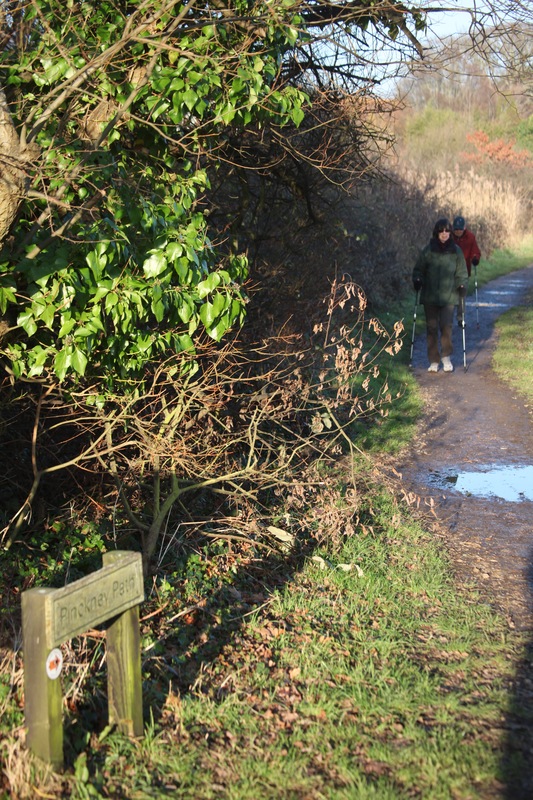 Other ramblers could be seen on the far side of the reserve, with the ferry boat making for the Isle of Wight beyond. 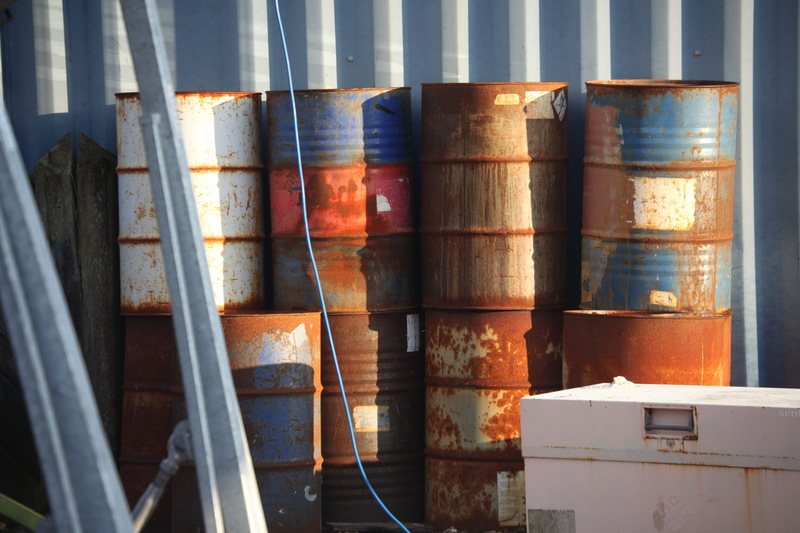 such as these container drums. A variety of hulls were prepared for work. 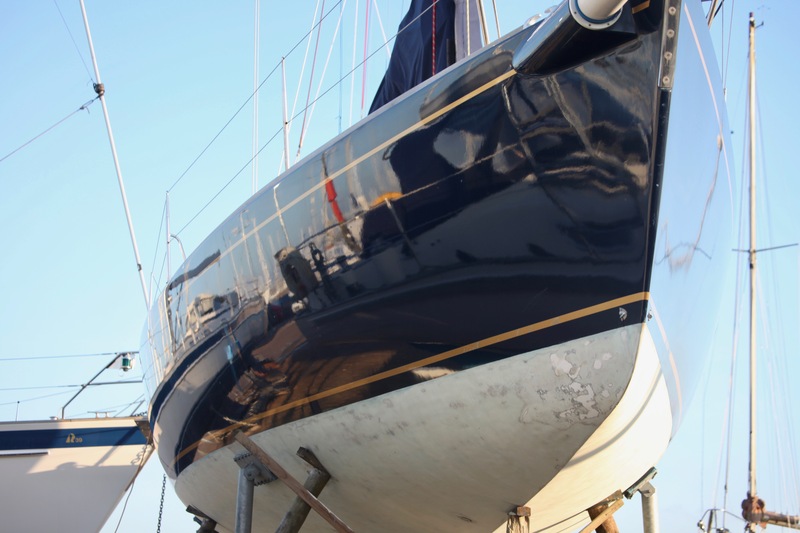 and on the hulls of the cleaner boats. 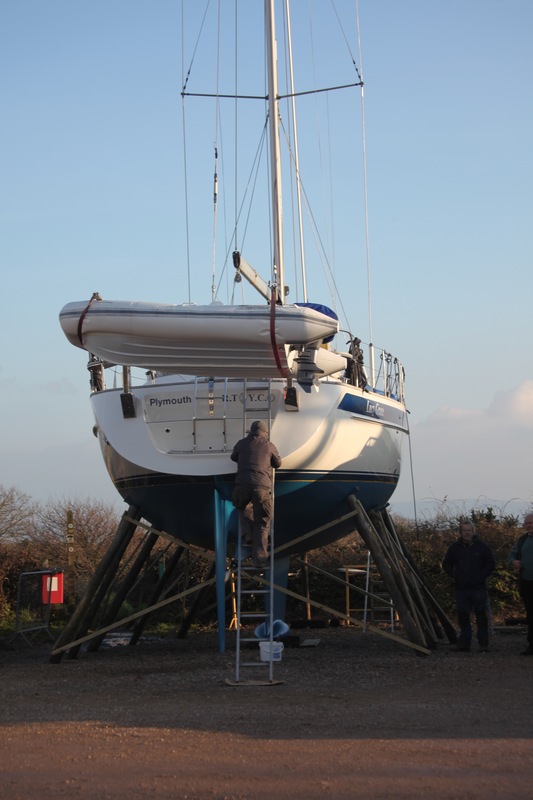 There was little work being undertaken, but this gentleman climbed down from ‘Plymouth’. 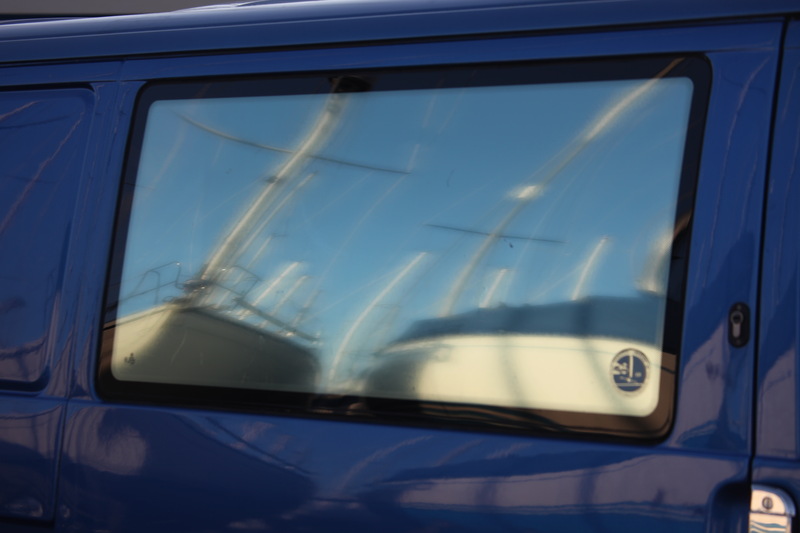 Walking through the boat yard led to the marina where boats and their reflections shimmered in the late afternoon sunlight. This evening we dined on further helpings of the roast duck and savoury rice, supplemented by spring rolls. I drank more of the cabernet sauvignon.